Yet another mass shooting has shattered lives and sensibilities across the nation. While the dead bodies were still warm and the facts opaque, the usual demagogues began firing off the usual salvo of blame-storming. Guns, or types of guns, or parts of guns, or gun accessories, were to blame. Angry white men. Congress. Gun manufacturers. Republicans. The NRA. You get the idea. As usual, the only solution to the believers of The Narrative is to ban firearms. Not all firearms, of course (at least not all at once), just the evil ones. Such people are often impervious to reason. Even so, I feel compelled to once again offer some reasoned, logical thinking on this issue. Either we have the right to life or we do not. Our Founders believed we do. They enshrined the “right to life, liberty, and the pursuit of happiness” in the Declaration of Independence. If we have the right to life, then inherent in that right is the subordinate right to self-defense from any threat, to include the threat of tyrannical government. Our Founders ensured we had the capability to fight any and all such threats by means of the Second Amendment. During the centuries between the ratification of the Constitution and today, Americans have amassed hundreds of millions of firearms and billions, if not trillions of rounds of ammunition. 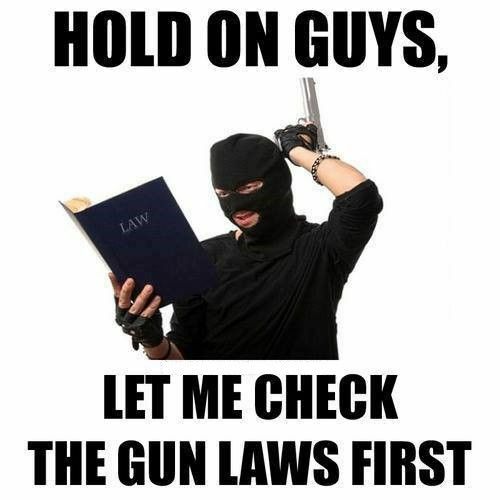 Since so many guns legally exist in the hands and homes of millions of people who have the protected right to possess them, and since a legal ban on guns could not make all guns everywhere magically evaporate, it follows that the only way we could eliminate all (privately held) guns everywhere in this country would be for well-armed government agents to confiscate them. One small problem. A government that once protected the rights of its people that then abolishes those rights by force is by definition tyrannical! Therefore: Because guns exist and can be used against the people, the people must have the right to have guns. Put another way: Infringing on the right to keep and bear arms is infringing on the right to life. Banning firearms would be nothing less than banning our right to exist. Of course the victims had a right to life. Of course we should limit the power of criminals and crazies to kill and destroy. The best way to do that isn’t by eliminating everyone’s access to firearms, it’s by limiting the criminals’ and crazies’ access to society! It is my contention that people with histories of violence, or diagnoses of psychological conditions making them prone to violent behavior, or those using prescriptions that have side effects that include tendencies toward violence, must be escorted in public, incarcerated, or institutionalized. No, they don’t. Rights come with the responsibility to respect the rights of others. Those unwilling or incapable of fulfilling such responsibilities have less claim to any rights than those who are responsible. The rights of the incompetent do not outweigh the rights of the competent. To paraphrase an analogy proffered by Bill Whittle: There are predators and there are prey. The leopard hunts the gazelle with stealth and claw and fang; the gazelle can fight back with numbers, speed, hooves, and horns. We cannot defeat, or even deter, the leopards of the world by erecting “no cat zone” signs (pro-tip: leopards can’t read) and cutting the horns off all the gazelles. However, we might improve the situation by trapping or “belling” the cats! Oh, one other thing: note that I did not mention the name of the latest mass murderer. Another mitigation we might consider: A significant number of the criminals and crazies out there want nothing more than notoriety. Lets deny it to them. Our media can stop mentioning or publishing the names of the shooters. Yes, doing so is well within the bounds of “newsworthiness” and the names are indeed part of the facts of the case – but why fuel these monsters’ cravings?